Book now for Summer!! Beautifully remodeled and modern. A recently remodeled family retreat. Gourmet kitchen, Central Air, beautiful hardwood floors and cabinets, granite countertops and stainless steel appliances!! 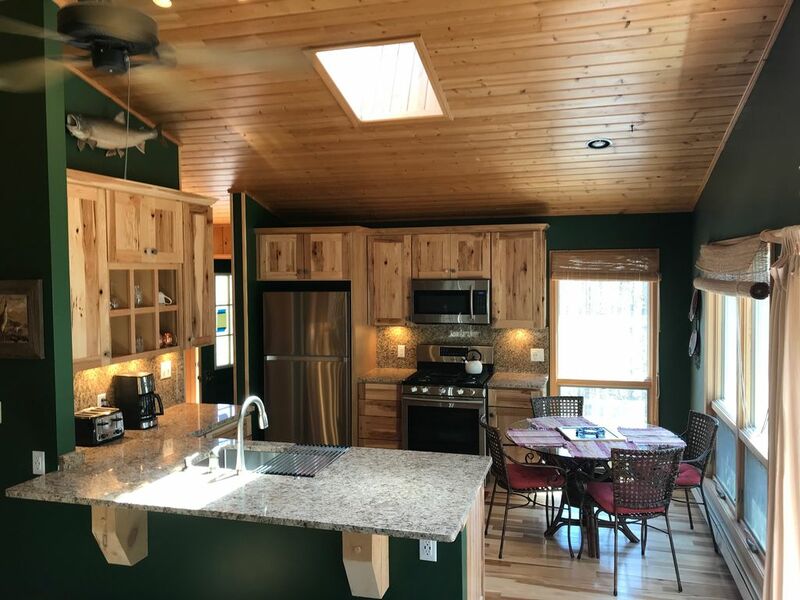 Sitting on 7 acres, this wooded and secluded setting on the Betsie River in Northern Michigan is the perfect home base for skiing, canoeing, kayaking, fishing, biking, snowmobiling, hiking and relaxation! Walk down the foot path to the rivers edge or sit in the swing while enjoying the beautiful view from the bluff overlooking the river. 7+ acres with 1200' of private frontage. 30 miles to Traverse City, 20 miles to Frankfort/Lake Michigan, 10 miles to Beulah/Crystal Lake, 4 miles to Crystal Mountain, 1/4 mile to the groomed snowmobile trails, ORV trails and state land. Sleeping Bear dunes 35 minutes away!! Take pleasure in the numerous activities of the surrounding area or just relax and listen to the river. Wildlife is abundant and the spring/fall fishing is GREAT! We are surrounded by hundreds of acres of pristine state land. Walkout basement with one bedroom with built-in bunk overflow sleeping accommodations. My family and I have been guests of The Betsie River Lodge as vacationers since 2007. When the opportunity to become owners came to be, we jumped on it! We have 4 children and reside in suburban SE Michigan. Overall our plan is to continue sharing this property with respectful weekend vacationers. Having family and vacationing in the area prompted our decision to invest into the area. We truly find the mix of rural quiet with close amenities to be right for our family and friends. We love it here! We are an active family!! Biking, fishing, hiking, golf, beaches, skiing, snowshoeing and winter activities galore!! No Land Line telephone. Does have very good reception for mobile phones. All bedding linens on beds. Professionally cleaned and regularly updated. Commercial Clothing Washer and Dryer for use. Plenty of parking for trailers and vehicles. Open areas. 2 Sofas, Smart TV/DVD, DISH TV w/NFL and College Football package. 125+ Channels. Parental controls. Hulu, Amazon, Netflix, etc. Stainless Steel appliances. Granite countertops. All the amenities of home. I’m actually from the area so when I saw this place come up, I had to check it out. The Bakers were very accommodating and responded quickly with anything I needed. The house was much more than I anticipated! It was fully furnished and the view from the swing and porch were beautiful. I’d book this house again in a heartbeat! Thank you! Wonderful remote property, immaculately clean. Amazing views & cozy beds. Couldn’t ask for more! Will be returning to enjoy this property in the summer time! This home was so beautiful and so well done. They made it simple and convenient to stay, and truly thought of every detail. From crushed red peppers to the pizza to sleds for the snow hill, every random thing we wanted/needed was available. It was clean, spacious, and all of the how-to-make-yourself-at-home details were well communicated. It was a quick, short drive to Crystal Mountain for a day of ski fun, and then a nice retreat back to the house to snuggle up by the fire. We are excited to come again some day! Thank you for the kind words!! We love to hear that guests thoroughly enjoyed their stay. And we truly hope you come back and visit us in the future! Winter is a great time to visit. LOTS of snow falls at BRL. Just beautiful. We would come back again. Everything was immaculate and perfect! It was so comfortable and relaxing. The Betsie River Lodge is beautiful! Clean and spacious with a great state of the art kitchen! Totally enjoyed the property, morning coffee on the swing over looking the river was a great way to start the day! Walks in the woods, fishing in the river for trout was good! Great vacation for the family!